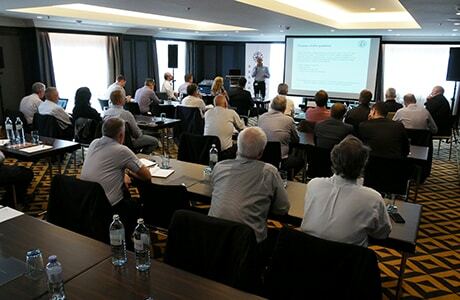 After changing the format of its annual meeting, the International Association of Concrete Drillers and Sawers, IACDS, celebrated a very successful 2017 Convention in Vienna, with the participation of almost 60 professionals and companions who enjoyed a complete three days program. On Thursday 18th, the first of the activities was a workshop called “Marketing the expertise of the specialists. How to promote the specialized industry”, which involved 25 participants that were divided into groups: suppliers, contractor and National Associations. The goal of the workshop was to identify the needs of the different costumes and elaborate a plan to offer them the best services and products. 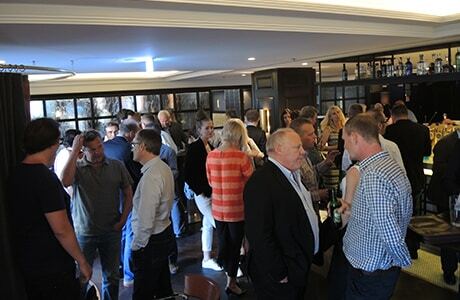 After that, and before the welcome cocktail, it was held the IACDS Board of Directors meeting, which was different, because, after the monthly meetings by videoconference, the members could exchange their thoughts together in person. Sponsored by the company member TYROLIT, the welcome cocktail was a perfect idea to meet all the Convention attendants and have a drink together, in this case, a tasty blue cocktail, the corporative color of the supplier company. On Friday 19th, at 9:00 in the morning, began the conference session with a warm welcome by the president of IACDS, Ms. Julie White, who thanked the participants and highlighted the change in the event’s format. The first technical presentation was made by Mr. Martin Goedickemeier, delegate of HILTI, about the IACDS Guidelines for anchoring of sawing and drilling equipment, full of recommendations and load considerations during operation. The general tone of the conference sessions was a high participation of the attendants, which promoted the discussion in every single presentation. Before the coffee break at the exhibition room, Mr. Michael Findeis, delegate of the German Drillers and Sawers Association, FBS, presented the new PQ6, a new conical six times polygon profile thread for drill bits. The PQ6 has been designed by the FBS and the manufacturers association in Germany, the VDMA (Verband Deutscher Maschinen- und Anlagenbau). 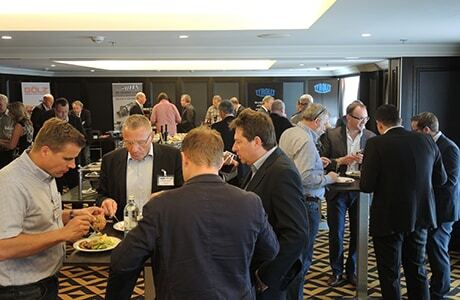 In addition, the attendants of the event could enjoy this new development at the exhibition room, which gathered them during the coffee break and that was possible with the support of TYROLIT, GÖLZ, LEVANTO, DIAMOND PRODUCTS and CRETEBEATER. Mr. Philippe Wingeier, delegate of Swiss Drillers and Sawers Association, SVBS, continued with the conference sessions with a presentation called “IACDS Standard for tolerances on concrete sawing and drilling”. 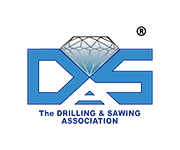 Mr. Wingeier shared the main guidelines of the recent document published by IACDS (Tolerances and limits for concrete drilling and sawing), how it has been updated from the first document, as well as the purpose of an International IACDS standard in this matter. After him, it was the time of Mr. Lars Sandström and Mr. Anders Andersson, from the Industry Association for Building Preparation of Sweden, BFB, who presented the topic “Beyond health & safety regulations: the critical issues to protect the workers and promote the concrete sawing and drilling applications”. The presentation was supported by the system job safe, an online tool that allows the training of professionals in health and safety. 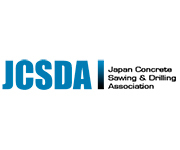 In addition, before the closing speech by Ms. Julie White, the Secretary-General of IACDS, Mr. Jose Blanco, spoke about “the Professional Card for concrete sawing and drilling workers”, a topic that received the feedback of the attendants in order to elaborate a road map for the future. Finally, Ms. Julie White wanted to ask for the opinion of the attendants about different topics in order to close the conference program. 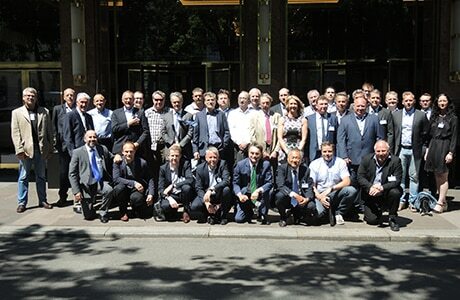 After lunch, the General Assembly of the International Association of the Concrete Drillers and Sawers took place, where the members reviewed the main subjects of the association, as well as the common issues of the industry. In addition, there was time to create an overview of the industry in each country, where the delegates shared the forecasts for the future. At the wonderful Vestibül Restaurant, with a friendly atmosphere, the attendants of the Annual Convention enjoyed a fantastic dinner, where like a tradition, the representatives of the different countries sang typical songs. On Saturday 20th, there was a leisure program designed, which consisted in a guided visit of the Schonbrunn Palace, a panoramic tour for Vienna, lunch and a guided walk through the historical center of the city. Next IACDS Annual Convention will take place in Tokio, Japan, in May 21-23, 2018, and more details about it will be provided in the following weeks.